Google’s Performance Summit has been and gone for another year and this year Google had a few surprises in store for us. With some major changes happening to Google’s AdWords and a re-design of Analytics there is something for everyone. You can watch the summit on Youtube here or keep reading to get a quick overview of the changes coming. The major mentions to come out of the summit were the changes happening to Google AdWords. With over two trillion searches per year or around 63,000 searches per second Google is still the world’s most preferred online search engine. However with the announcement from Google that their ads are going to take up more of our screen space than ever before people may start looking elsewhere. 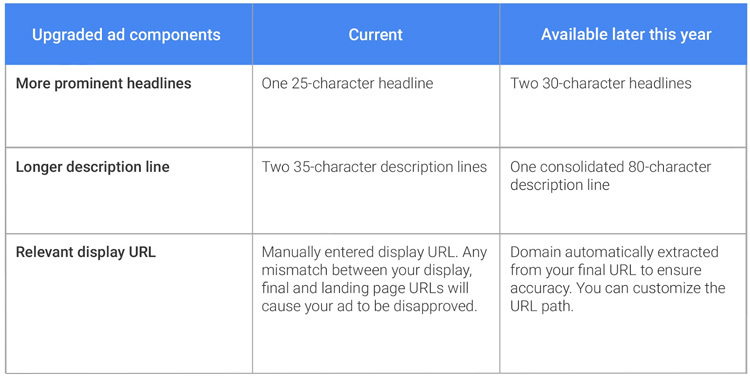 After removing their right-hand ads earlier this year and increasing ads above organic listings from three to four, Google will soon give its advertisers the ability to make their ads even longer with two 30-character headlines instead of the current 25-character headline and one 80-character line of description copy instead of two 35-character lines. This will further push organic rankings further down the page making it harder for those businesses doing SEO to get noticed. While longer ads seems like a step backwards for Google, there was some positive news with the announcement that advertisers will soon be able to set separate bids for mobile and desktop ads. This will allow advertisers to set higher bids either on their mobile or desktop ads depending on their performance. There is also good news for display advertisers. Google announced that it is expanding the reach of its display and remarketing network giving you access to more websites and apps around the world. Also good news is Google’s investment in dynamic ads on their display network allowing advertisers to create dynamic ads which should have a higher conversion rate. Another major announcement from the summit is Google’s movement towards more paid ads in Google Maps. Google is looking to introduce “promoted pins” or “promoted locations” on Maps which use location extensions from your adwords. The main purpose of ads on Maps is to drive more offline foot traffic into stores when you are out and about. Google says it’s still only experimenting at this stage but we are likely to see more in the near future. Do you find Google Analytics difficult to navigate? Thanks to Google’s efforts in machine learning you can soon ask your Analytics questions such as “How many users did we get from organic search in April?” and receive the answer. This feature, however will only be available in the premium version of Google Analytics, Google Analytics 360 Suite. If you don’t want to pay for the premium version don’t worry. Google Analytics is getting a-much needed facelift to make it more user-friendly and easier to navigate. The re-design will take a while but Google promises it will be worth the wait. With so many big changes announced at this year’s summit, website owners and digital marketers around the world need to take the time to see how these changes will affect their marketing strategies or website performance. If you are worried about how these changes will affect your website or digital marketing efforts, or if you’re excited by the opportunities they can provide, get in touch with the team at Mogul today to find out how we can help you.